Organic Cocoa Butter has been added for its hydrating and nourishing properties, full of vitamin A, E and C, helps keep your skin supple and protected - Organic kiwi extract rich in vitamin E, is used for its ability to maintain moisture in the skin surface layer keeping it bright and smooth. Organic Kakadu Plum extract, known to be the world richest source of vitamin C delivers a nutritious and antioxidant daily treatment, maintaining skin radiance and health whilst minimizing future damage. A gentle formula for everyone to Enjoy!! 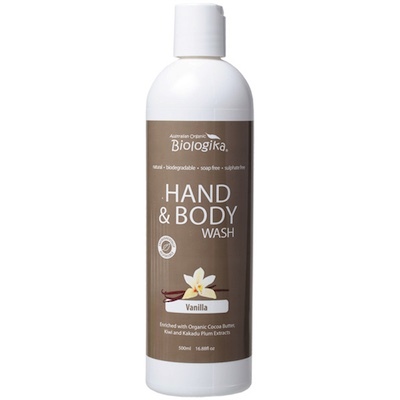 Ingredients: purified water, organic coconut oil, decyl glucoside, organic cocoa butter, organic aloe vera extract, organic kiwi extract, organic kakadu plum extract, xanthan gum, vanilla pure absolute oil, olive leaf extract, potassium sorbate and citrus seed extract.